After receiving a comment on a previous blog post, I added some preferences and redesigned my preferences dialog. It now has three tabs: Main, Extended, and Address. The wording and layout of the preferences will probably change, but any feedback is welcome. All of the main preferences. Name of the Address Book – The name of the Address Book that is synced. The default is Google Contacts. You should synchronize contacts before changing the name, and you will have to delete the old one if you want. 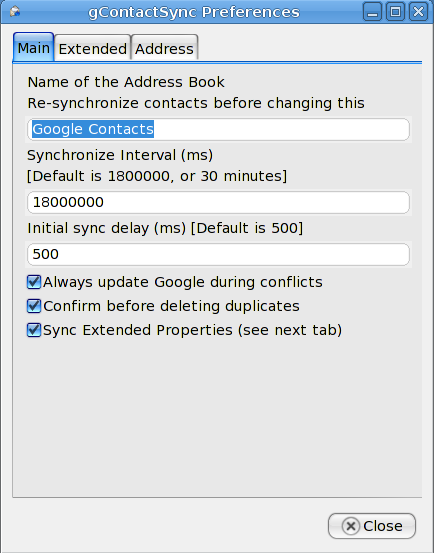 Initial sync delay – How long the extension should wait after the Address Book is opened, in milliseconds, before synchronizing. Always update Google during conflicts – Check this if Thunderbird should have priority if a contact changes in Thunderbird and Google Contacts. Confirm before deleting duplicates – Check this if you would like to be prompted to delete each “duplicate” that the extension finds. Recommended. 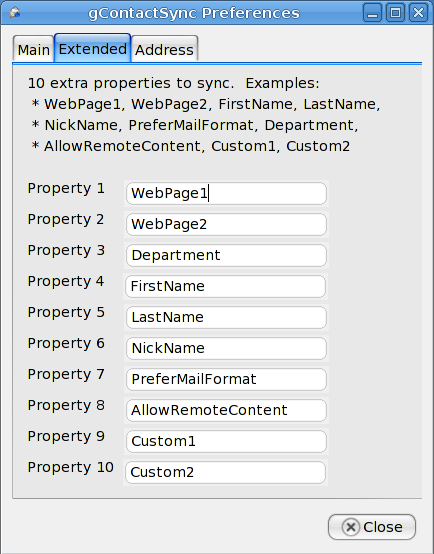 Sync extended properties – Check if you would like more properties (like Department, FirstName, LastName, NickName, etc.) synchronized. They will not be visible from Google Contacts. The next section explains this in more detail. The extended properties to synchronize. As explained before, they are not visible from Google Contacts, but they are visible from the New and Edit Card dialogs. Leave the last few blank if you don’t want to synchronize 10. The last checkbox on the previous tab (Main) must be checked to sync these properties. This tab determines how addresses are synchronized. 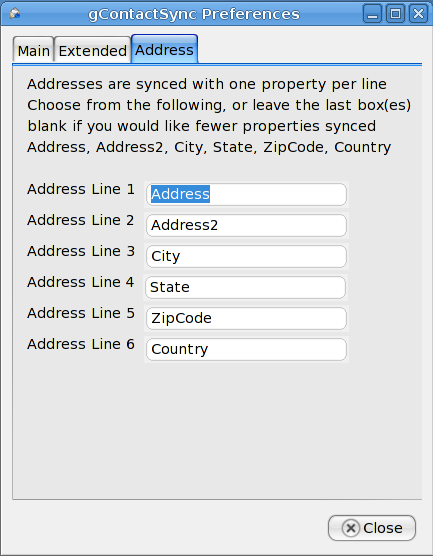 As explained in a previous post, Google only has one field that allows multiple lines for addresses while Thunderbird has 6: Address, Address2, City, State, ZipCode, and Country. My solution is to separate different attributes in Thunderbird with a newline character. You can choose up to 6 attributes to sync. Don’t include Home or Work in these. Valid choices are limited to Address, Address2, City, State, ZipCode, and Country. If you type something else it will not sync. If you do not want any or all attributes synced, leave blank line(s) at the end.